She sells chicken strips by the seashore. It may not be charming, but it’s easy to find because of the big sign. Deep fried foods… nutritionists tell us to avoid them, but our appetites tell us to order them for lunch. So head over to Boardwalk Betsy’s World Famous Strips, Dips ’n’ Chips. 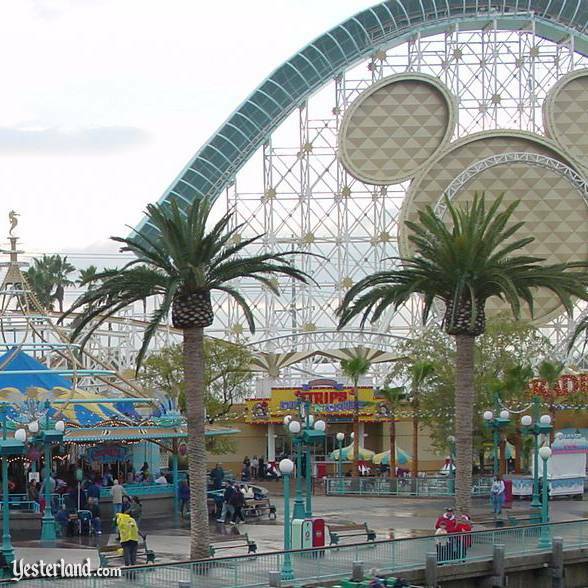 To find Boardwalk Betsy’s place, look for the big Mickey head on the roller coaster. Boardwalk Betsy serves deep-fried fish filets, deep-fried chicken strips, and deep-fried mozzarella strips—all served with deep-fried jumbo french fries. If that’s not enough fryer fat for you, you can also get deep-fried funnel cakes. There’s no children’s menu, but the entrees at this eatery are perfect for sharing. They all come with jumbo fries. It’s your turn to order. Boardwalk Betsy’s friendly cooks prepare your meal. The fish includes tartar sauce in addition to a dipping sauce. If all you really want is a serving of jumbo fries with a dipping sauce, that’s another option. If you prefer something that’s not deep-fried, have some apple wedges with caramel sauce for dessert. Oh, and the Coca Cola and other beverages aren’t deep-fried either. But, frankly, if you don’t want deep-fried foods, what are you doing at Strips, Dips ’n’ Chips anyway? Take your food to a table along Paradise Bay. 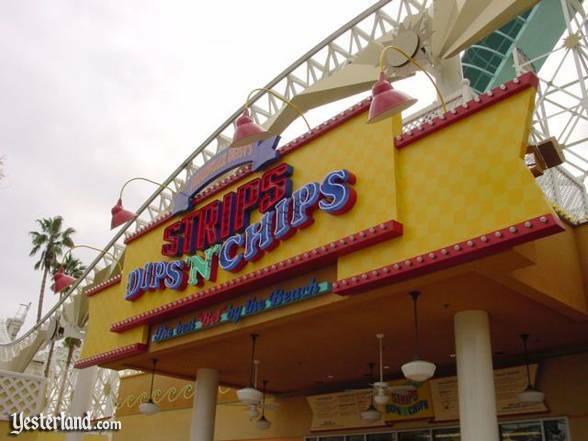 California Adventure opened in February 2001 with Strips, Dips ’n’ Chips as one of many places to eat. Unlike nearby Malibu-Ritos, which closed in the park’s first year, Strips, Dips ’n’ Chips operated for more than five years (although not every day). When Strips, Dips ’n’ Chips first opened, Boardwalk Betsy’s face was not on the marquee. 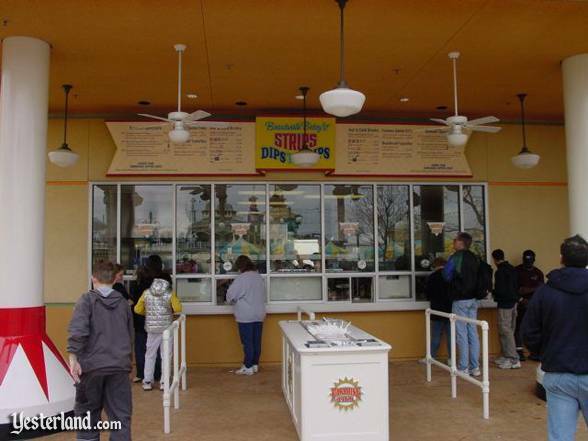 In September 2006, a construction wall went up in front of Strips, Dips ’n’ Chips. 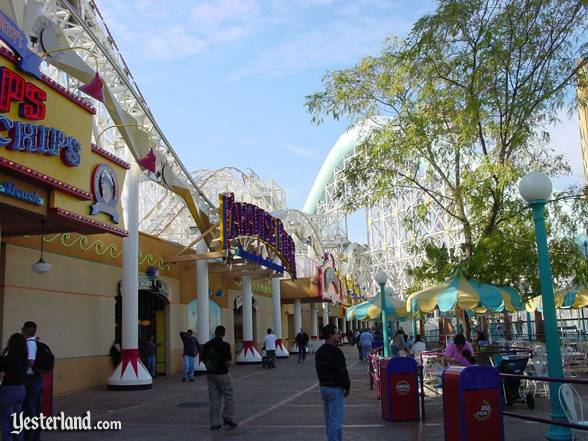 Two months later, workers demolished the boxy stucco building that had contained Strips, Dips ’n’ Chips and Malibu-Ritos to make way for the Victorian splendor of Toy Story Midway Mania. The Farmers Market became the new spot for deep-fried chicken, mozzarella, and fish. Soon after Strips, Dips ’n’ Chips closed, its popular deep-fried menu moved to the Bountiful Valley Farmers Market. 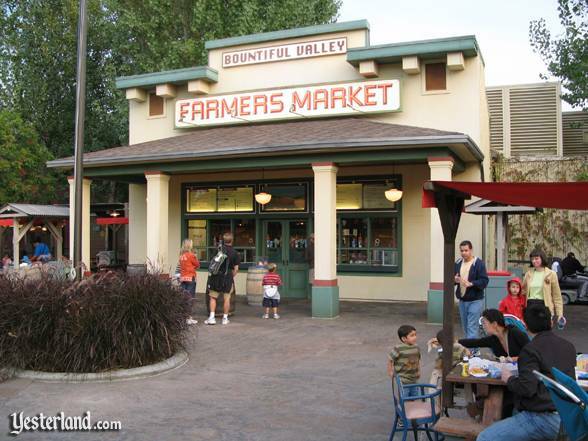 The original 2001 menu of the Farmers Market had emphasized fresh, healthy foods, but the eatery was seldom open until the fried foods arrived in 2006. The eatery closed permanently September 7, 2010, for the demolition of Bountiful Valley Farm. 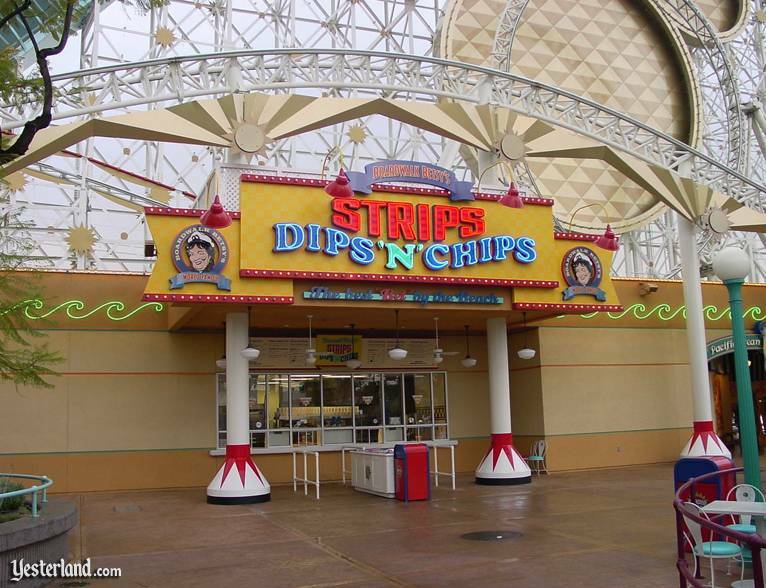 Photo of Strips, Dips ’n’ Chips sign with California Screamin’: 2001 by Allen Huffman. Photo of Strips, Dips ’n’ Chips without people: 2001 by Allen Huffman. Photo of Strips, Dips ’n’ Chips with Mickey Mouse head: 2001 by Allen Huffman. 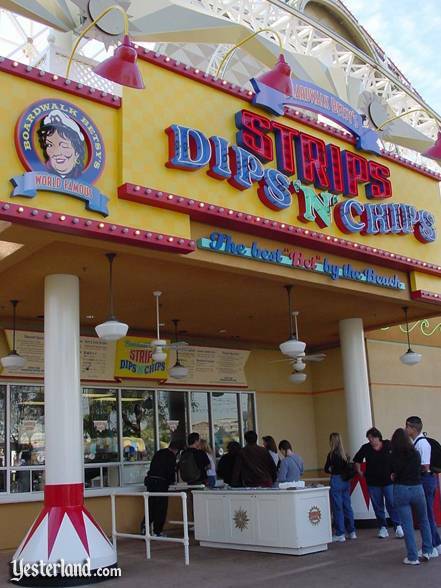 Photo of Strips, Dips ’n’ Chips with people in line: 2001 by Allen Huffman. Photo of Strips, Dips ’n’ Chips order window: 2001 by Allen Huffman. 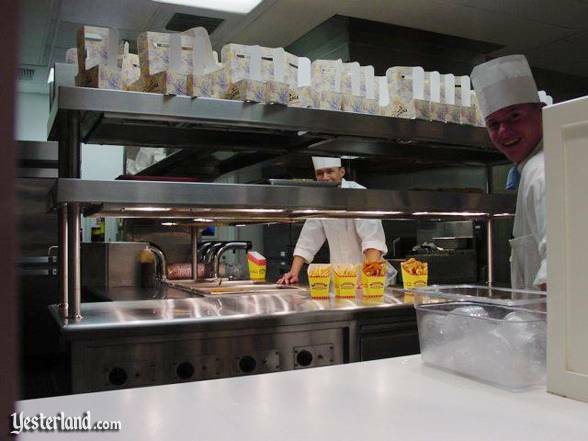 Photo of Strips, Dips ’n’ Chips cooks: 2001 by Allen Huffman. Photo of Strips, Dips ’n’ Chips seating: 2001 by Allen Huffman. 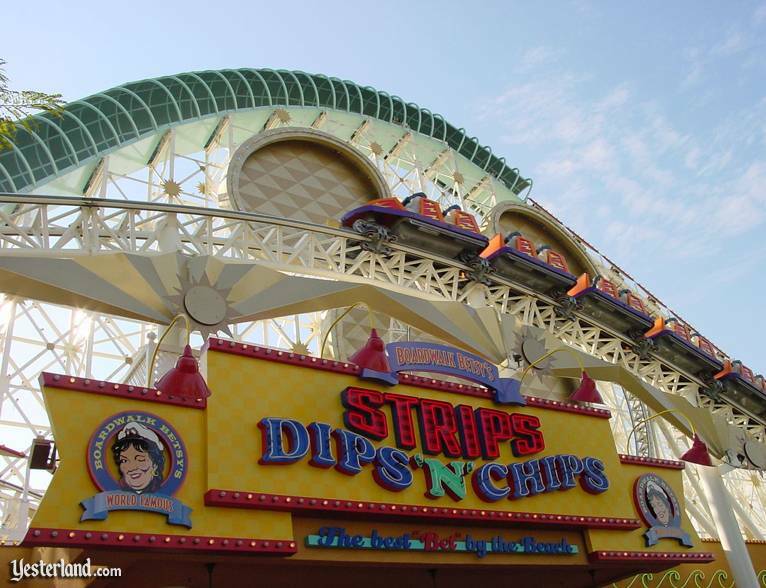 Photo of Strips, Dips ’n’ Chips sign without Boardwalk Betsy: 2001 by Allen Huffman. Photo of Bountiful Valley Farmers Market: 2007 by Werner Weiss.